Ever since I saw the first one, I’ve been slightly obsessed with Orla Kiely bags, especially the Etc. vinyl-coated fabric ones. My friend Lessley gave me the best birthday gift ever last year, a fabric Bungalow 360 bag. It’s super lightweight, has the perfect combination of pockets, and zips fully closed across the top. I love it. The only problem? It’s disgustingly dirty because it’s impossible to clean. While eating breakfast one morning, I thought, “I could save up for an Orla Kiely bag.” But, honestly, I don’t want to. Then I looked up at the pinned-up curtains covering my storage shelves. Aha! I could use the extra from that to make a handbag! 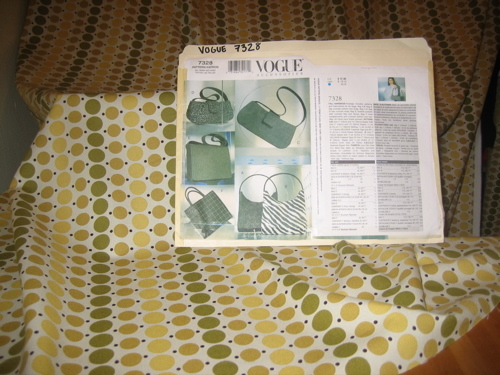 And I even have an old pattern (Vogue 7328) that has a similarly shaped hobo-style handbag pattern. But how do I protect the fabric from stains? Scotch-Guard did nothing to protect my Bungalow 360 handbag. I’d have to find a coating, like a fusible vinyl, to protect it, which would also make it look more like the Orla Kielys. And then I found it online! I’m going to make the curtains this weekend and see if I have enough left over to make the bag. Sadly, reprodepot.com doesn’t have any more of the fabric.